The total financial performance (comparing all capital draw downs with all capital, interest and fee payments) over the 12 year period was negative 9.25% (-0.77% annualised)*. Counterintuitively, this is remarkably good given that pricing of capital was driven by affordability and not risk adjusted. Moreover, most of these social investments were made after the investees had been refused finance from High Street institutions. They would therefore be classified as high risk deals. The anonymised data sample covers 425* closed investments relating to £42m of capital deployed. The dataset includes both debt and equity deals made from 2002 until 2014 by CAF Venturesome, Key Fund and Social Investment Business. It was published by EngagedX and the Social Investment Research Council with the support of the RBS Group. The tabulation below compares the overall financial performance with the respective performance for the most recent 5 year period (2009-2013)* and the preceding period (2002-2008). It reveals how financial performance in the social investment market seems to have improved significantly since inception. 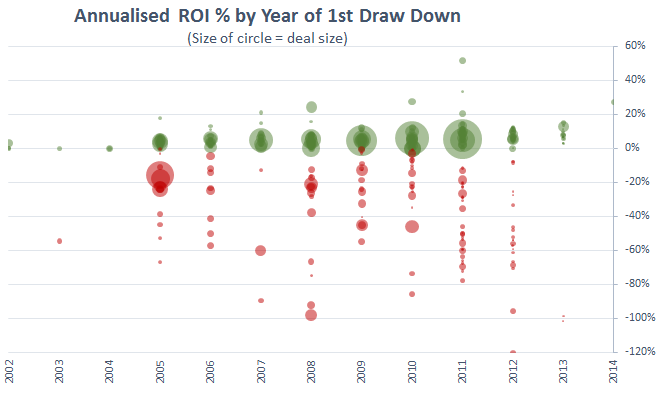 Analysing the deals by date of draw down, in other words assessing if total performance changed over time, the data suggests that financial performance is indeed improving. This is consistent with a market that is maturing. Deals made within the last five years delivered a total return of negative 3.37% (-0.67% annualised)* – three times better than the overall 12 year period and six time better than the seven year period preceding 2009, which was negative 17.50% (-2.50% annualised)*. This significant improvement is not only remarkable because it occurred in the wake of the financial crisis, but also statistically significant because it relates to over half the sample by both number of deals and amount of capital deployed. The early days of any market are experimental and often prioritise market building strategies over financial gain. In this market, the initial focus was to test the viability of deploying repayable capital to social purpose organisations (like charities and social enterprises) who are unable to access mainstream finance. This social investment is an additional form of funding to augment the scarce sources of charitable grants and public subsidies, as well as revenue streams that are ad hoc or cyclical. Financial performance is only half the story of social investing. Being able to evaluate social impact as a bona fide non-financial return on investment is equally important. Without robust and comparable impact data, it is impossible to judge investment performance fairly and to understand the complex interrelationship between financial returns and presupposed social impact creation. * Note: One outlying investment of £60k that opened and closed in 2014 was removed from the sample in order to undertake more accurate analysis for calculating the annualised returns stated in this article. There was a negligible effect on the results, however for consistency this article has been updated where relevant since original publication. Different versions of this article have been edited and published respectively by the City of London Corporation and Pioneers Post. This entry was posted in Articles for Others, EngagedX and tagged data, EngagedX, social investing, social investment. Bookmark the permalink. If the more recent social investments have a -3.4% return in purely financial terms to the investor, and without any attempt to assess value generated for other stakeholders, such as savings in welfare, health or criminal justice budgets), or all the other SROI-type calculations, then it would indeed seem a viable approach. How could we make these unmeasured benefits more visible, so that they would motivate more social investors? To publicise the individual cases would be one way.